When was the Guitar invented? Historians tend to agree that the Guitar was invented in c. 1500 BC and the first known use of the Guitar was during the Ancient World period of inventions (3500 BC - 600BC). Who invented the Guitar? The name of a specific person has never been credited with the invention of the Guitar. The invention of the Guitar is so old that the name of the inventor has been lost over time, although it is believed to have been originally called a 'sihtar' and created in Ancient Persia (modern day Iran). Definition of the Guitar: The Guitar is defined as a stringed musical instrument usually having a hollow body, six strings, but can be made with four to eighteen strings, that is played by strumming or plucking with the fingers or a plectrum. The musical instrument resembles a larger version of the lute or the violin. The main parts of the "acoustic" guitar are the body, the headstock, the fretboard, and the strings. Fact 1: Who invented the Guitar? The name of the inventor of the Guitar is unknown but it is believed to have been invented in Ancient Persia around 1500 BC, during the Ancient World era of inventions (3500 BC - 600BC). Fact 2: Who invented the Guitar? The origins of the word guitar can be traced back to the Old Persian word 'sihtar', meaning "three Strings" from 'sih' means "three" and 'tar' meaning "string". Fact 3: Who invented the Guitar? The word 'tar' therefore means "string" in Persian and is the root of a number of stringed instruments such as the Indian sitar, the Persian chartar, the Turkestan dotar, the Afghanistan panchtar, the Spanish quitarra, the Italian chitarra and of course, the guitar. Fact 4: Who invented the Guitar? The ancient Persian musical instrument called the 'sihtar' was a member of the lute family and derived from the earliest stringed instruments known as the tanbur that were used in Mesopotamia, Ancient Egypt and Persia. It was a long-necked, fretted string instrument that was plucked. Fact 5: Who invented the Guitar? Today the 'sihtar' is now known as the 'setar' and was originally a three-cord instrument with a flat wooden soundboard that was plucked by the player's forefinger's nail. The 'sihtar' was later converted into a four-cord instrument during the Qajar dynasty (1789–1925). Fact 6: Who invented the Guitar? The first guitars evolved in Spain during the 13th century and were known as the 'gutarre latine' and featured strikingly in-curving sides. The early Spanish guitar was built in different forms and there were both four string and four of five course guitars. Fact 7: Who invented the Guitar? The Spanish guitar spread to other European countries including Portugal, England, France and Italy. A 1547 inventory of King Henry VIII of England included 21 guitars in his collection of musical instruments. Fact 8: Who invented the Guitar? The six string guitar evolved and became widely used in Europe during the 17th and 18th centuries and soon spread to the colonies of the New World. The popularity of the guitar began to rival that of the lute. The earliest known six-string guitar that is still in existence was built in 1779 by Gaetano Vinaccia (1759 – 1831) in Naples, Italy. Fact 9: Who invented the Guitar? In 1859 the Spanish guitarist Antonio Torres Jurado (13 June 1817 - 19 November 1892) invented the modern "classical" guitar improving the volume, tone and projection of the instrument. Most of the acoustic guitars used today originated from his designs. Fact 10: Who invented the Guitar? In the 1900's guitars became the dominant musical instrument in popular music from the early days of jazz to the advent of rock and roll. Fact 11: Who invented the Guitar? A German-born American called Christian Fredrich Martin (January 31, 1796 - February 16, 1873) was a luthier who specialized in repairing guitars. 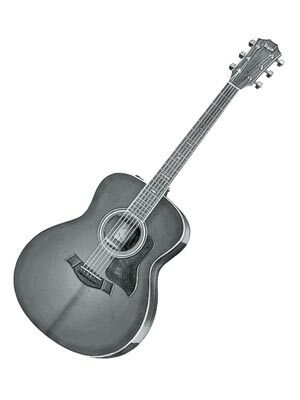 In the 1920's Christian Fredrich Martin began making steel string acoustic guitars with X-braced tops. The Martin steel-string guitars replaced the traditional catgut strings. Fact 12: Who invented the Guitar? Steel strings offered the promise of much louder guitars. Fact 13: Who invented the Guitar? An American luthier called Orville H. Gibson (May 1856 – August 19, 1918) founded the Gibson Guitar Company in Kalamazoo, Michigan in 1896. Orville Gibson invented archtop guitars by constructing the same type of carved, arched tops used on violins. This allowed the top to vibrate more freely, and thus produce more volume. Orville H. Gibson died on August 19, 1918 but his company continued. Fact 14: Who invented the Guitar? In 1921 the Gibson Guitar Company employed Ted McHugh who invented the adjustable truss rod and the height-adjustable bridge. To this day, all Gibson guitars are equipped with truss rods based on Ted McHugh’s design. Fact 15: Who invented the Guitar? In 1922 sound engineer Lloyd Loar joined Gibson and designed the legendary F-5 mandolin and the L-5, considered by many to be the first "modern" acoustic guitars. By the 1930's, Gibson was producing several flattop models and a budget series known as the Kalamazoo line in honour of the town in which they were produced and the Gibson company was founded. Fact 16: Who invented the Guitar? The need for Electric Guitars arose because the classic guitars were too quiet for large venues. It was the Hawaiian-style lap steel guitar was first electrified. In 1931 George Beauchamp (March 18, 1899 – March 30, 1941) who played Hawaiian guitar joined with instrument maker Adolph Rickenbacker (April 1, 1886 – March 21, 1976). Their aim was to invent a guitar that was significantly louder than the original acoustic version. Fact 17: Who invented the Guitar? In 1932 Beauchamp and Rickenbacker produced the first cast aluminium versions of the electric lap steel guitar, nicknamed the frying pan which they patented in 1934 patent #2,089,171, although the Patent Office at first did not know if the "Frying Pan" was an electrical device or a musical instrument. The "frying pan" was the first electric lap steel guitar ever produced, and one of the earliest electric guitars. Fact 18: Who invented the Guitar? In 1936 the Patent for the electric guitar (called the electro Spanish guitar, a hollow-body electric guitar) was given. The Rickenbacker company became the world's first to produce electric guitars and eventually produced a range of electric guitars and bass guitars. Fact 19: Who invented the Guitar? The electro Spanish guitar hollow body was prone to distortions and feedback from the body and strings. To address these problems, various inventors experimented with producing solid-body guitars. Fact 20: Who invented the Guitar? In 1940, Les Paul (June 9, 1915 – August 13, 2009) created “The Log,” a guitar whose strings and pickups were mounted on a guitar body carved from a solid block of wood. Fact 21: Who invented the Guitar? The Gibson Les Paul solid body electric guitars, with a gold finish, were later produced and first sold by the Gibson Guitar Corporation in 1952 and the solid-body electric guitars were here to stay. Fact 22: Who invented the Guitar? Since the 1960's rock and roll has been strongly associated with the electric guitar and used by legends such as Chuck Berry, Eric Clapton, Robert Palmer, Keith Richards and George Harrison who have made the guitar a cultural icon.